If you really wanna surprise people, try playing this with Greater Emerald Spellstone for instant 14 burst damage. Nothing like watching newbies dismiss Tundra Rhino the first time its played, thinking, "pah, 2/5 with Charge, practically irrelevant"
And then turn 6 you have your Savannah Highmane charge, then his deathrattle minions charge, and as they scramble to find some way to eliminate or defend the beast they've gravely underestimated, you repeat the same thing next turn with Violet Wurm. And that's not even mentioning what this does with Hunting Mastiff and Scavenging Hyena... good times. Charge needs to be removed from game forever. This card will be auto include in all midrange hunter decks. with call of the wild and synergies with infested wolf late game makes this high threat card last expansion into a massive threat in this one. there are a lot less removal in this meta so the chances of it surviving are very high. drop this turn 5 and it gets dealt with immediately baiting out hard removal for your turn 6 drop. or it gets ignored and they lose. The streamers all say that this card is bad in this meta and thus never even thought about putting it in any hunter deck. Trust me, they're wrong. Snake Trap turn 6 Tundra Rhino turn 7 (if he survives!) turn 8 Call of the Wild good night godbless! 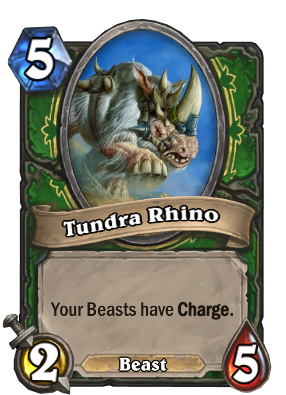 I think Tundra Rhino got a bit better with the introduction of King's Elekk and Ram Wrangler. It has low attack but it is a very strong card when you can keep it on the field for a few turns. This is a great 5-drop, when you can play Savannah Highmane on turn six and just charge it into your oponent or trade and use 2/2 on tha same turn it is just great to comeback from a bad situation or snowball. Tundra Rhino x 2 are a reward for raising a hunter to level 8.